FOLLOW THAT FIRE is proof that artists can still reach out to a new audience even with nineteen years-experience and nine albums in the bank. 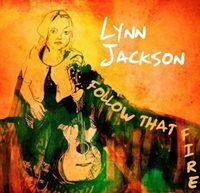 The latest record from Canadian singer-songwriter Lynn Jackson is a lovely textured alluring release successful in creating a sense of well-being. It has been released on the Busted Flat record label, which has been responsible for some fine Canadian exported music in recent years. It may grow the international awareness of an artist adept at taking a primarily folk song base before dressing them up in a cultured pop and sensual soulful coating. All ten tracks are original offerings from the mainly solo pen of Lynn and are brimming with messages ranging from the inspiration of the road to taking a pensive view on the plight of an artistic journey. While the record generally meanders through the tranquil waters of lucid folk, there is one tremendous jolt in the first half with a song reverberating in its grim effect. ‘Alice’ evolves as a spicy narrative tale, in true folk tradition heading for a gruesome and total left field conclusion. It’s compulsive listening, not representative of the album in general theme, but a track to forge a bind with the listener. A further successful formula for making this album work is the harnessing of a sophisticated soundtrack to provide the ideal canvas for Lynn’s gorgeous vocals to flourish. Soft piano joins the usual stringed array in the early stages of the album especially ‘Random Breakdowns, False Starts & New Beginnings’. However, by the latter stages the keys have taken the sound in a far more soulful direction as exampled in ‘Meet Me in the City’ and ‘Night Come Down’. This comes to a pinnacle in another of the album’s stand out tracks ‘Tossing and Turning’. The vocal style is somewhat similar to Frazey Ford at this stage, with hopefully some resemblance of the Be Good Tanyas being distinguished praise. This standout piece unravels as a restless song in a restful setting. Messages come across at their strongest in the opening and closing tracks. Title number ‘Follow that Fire’ gets proceedings under way in a suggestive and prompting way. Forty odd minutes later ‘No Regrets’ brings everything to a thoughtful close with self-explanatory sentiment and a catchy melody adorning a dreamy number. Intermediary, you get further evidence of a perceived theme with ‘Side of the Road’, while ‘Ghost’ and ‘Mystery Novels’ succeed in keeping the listener actively engaged even away from the album’s true golden moments. The gradually ascending feel to this album makes playing it in its entirety a purposeful exercise and not one designed for the pick ‘n’ mix digital world. It eventually rolls out as a record purely heart accessible and head compatible. Lynn Jackson has clearly drawn on many aspects of her vast experience to sculpture the delights of FOLLOW THAT FIRE and any ensuing success is absolutely warranted.